How would you feel if others could access your personal data and information? Do you think you’ve got nothing to hide? Most modern phones have the ability to store and automatically enter usernames and passwords, as well as keeping records of your phone calls, texts and those late night Googles. Encryption has been a topic of much controversy. It is key for protecting personal data but hinders law enforcement and government agencies when solving cases and stopping potential terrorist attacks. After the 2013 Edward Snowden data leaks, many technology companies, including Apple, strengthened their encryptions. Consequently, government agencies will not be able to bypass the data encryption. This issue was highlighted in the 2015 San Bernardino Case of the FBI vs Apple, where the FBI asked Apple to create a ‘backdoor’ into their secure devices. Should Data Privacy and Civil Liberties be protected or should National Security be prioritised? 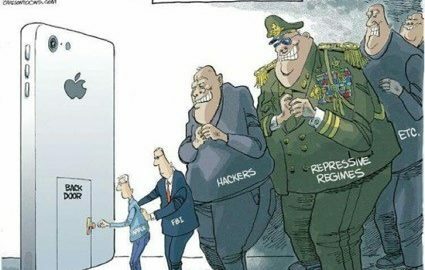 Whilst Apple recognised a legitimate need for cooperation with law enforcement on matters of national security, they refused to build a backdoor to the iPhone as they believed it to be fundamentally wrong to jeopardise the integrity of the iPhone security and their core values as a company. One of Apple’s core values is to protect customer’s privacy when using their products; therefore, it can be said that they have a duty of care to uphold security and data encryption. By upholding their core values as a company, Apple acted ethically in line with Duty Ethics when refusing to build the backdoor. A key part of Apple’s customer care is in building a two-way relationship; customers’ trust that Apple will safeguard their welfare. In valuing the importance of this relationship and refusing to build the backdoor, Apple acted ethically according to Care Ethics; they valued maintaining their strong relationship with their customers over their relationship with the FBI. A backdoor technology would make extracting a suspect’s data easier, however, it introduces a large-scale insecurity and weakens our national privacy. As an exploitable technology, it would make it easier for other foreign intelligence agencies and hackers working for criminal organisations to conduct mass surveillance, steal national and trade secrets, or use it for other nefarious purposes. Utilitarianism would mean that by refusing to build these back doors, Apple was acting ethically, as by not building the backdoor they were ensuring the security, and therefore happiness of a greater number of people. In addition to this, the overall likelihood of being affected by a terrorist attack or a crime case is low for many people; therefore, their major concern would be data security. Did the FBI violate the First Amendment right within their Constitution to Free Speech? In the United States, and many countries across the world, the right to free speech is highly prized. There is precedent to suggest that code is legally protected speech. By asking Apple to write code to get in the backdoor, it is being compelled to say something against its wishes. Therefore, according to deontological ethical theories, the FBI was acting unethically by violating the right to free speech. FBI – Just give us the key? Should governmental policing bodies such as the FBI be allowed access to our mobile devices and data? We live in a world where approximately 4.68 billion people have a mobile phone. This digitalisation of our daily lives has created a catalogue of data on any individual or group and this data can be used to save lives. The purpose of law enforcement agencies is to prevent the breaking of the law, to protect citizens from harm, and to prevent crime and disorder. In a digital age, digital resources are needed in order to facilitate this. Allowing access to vital data enables the protection of the people both immediately in relevant cases and through the implementation of long-term security measures, like counter-terrorism. It can therefore be argued that providing this data is ethically justified through Utilitarianism. By way of example, the Paris attacks of 2015 were conducted and orchestrated by mobile phone; had the police had access to the information from their mobiles, as requested, the attacks would most likely have been prevented and 130 lives saved. This demonstrates the immediate applications of how mobile data can be used to save lives. If you were in a situation where your life could be saved if the police had access to another’s mobile device, would you want them to do so? In Kantian ethics, the principle of categorical imperative would mean that if you would want this, then the FBI would be justified in also having access to your mobile data to save another’s life. Privacy is one of the primary reasons given for withholding such data and yet this privacy can be maintained and even bolstered whilst also allowing access to mobile devices. Currently the authorities only require a warrant to obtain the phone itself, but not required to access the data on it. Privacy could be strengthened by requiring a warrant to access a person’s data. This would ensure that the data is accessed only when necessary, ensuring no abuse of the system. During the case of Apple vs. The FBI, the FBI resorted to the use of a third party to obtain the required data. If it were required that the authorities had to enlist Apple’s assistance in accessing the phone data, rather than them knowing the specific method of bypassing the encryption, then this would prevent unauthorised access and therefore avoid exploitation and abuse of power. By offering a legal, monetary reward, this essentially condoned and promoted the act of cyber hacking. As a result, there was an increase in global iPhone hacking attempts. Once the data had been obtained, it was then passed through multiple parties resulting in increased violation of privacy. Had Apple allowed the FBI access to the data in the first place there would have been minimal exposure to private information and a reduced incentive to hack iPhones. Upon reviewing these points, we agree with Apple’s decision not to help the FBI through the ‘backdoor’. I’d say if you’re not doing anything wrong you’ve got nothing to worry about when it comes to government surveillance. Just need to make sure that the line between national security and thought police style monitoring isn’t crossed. I don’t think that the idea of treating code as an extension of free speech has much merit. If that were the case, the author of any piece of malware could claim that their rights were being infringed if they were arrested. I think that it makes much more sense to focus on the fact that governments shouldn’t be able to exercise this level of control on the merchandise of a private company. After all, if all lock makers were required to provide access to any government official who fancied borrowing a cup of sugar, would the reaction be the same? Anonymity and privacy are some of the biggest issues with social media today. Indeed, societal norms of interpersonal politeness are breaking down because of this. If we knew everything we were to write or send could to be traced back to us, we might avoid some of the aggressive, hostile and often criminal uses of social media we see today. Open up the ‘front door’ so you don’t need the back one! I found myself agreeing with both sides of the argument which just goes to show how very contentious this topic really is. On the one hand I seriously believe that if I have nothing to hide, then why should I worry what data can be accessed by “the authorities “? On the other their hand, if some of my info can be accessed by “the authorities “ even though I don’t have anything that is illegal to worry about, what happens if I have sensitive or personal data that I don’t want broadcast that could get into the wrong hands just by the fact that it IS possible to be accessed? Confidential data leaked by Snowden set the security services back massively in their quest to defend us from terrorism. Leaking that info had grave consequences. Anonymity in social situations such as on Twitter I believe is a good thing – or at least it can be. It allows people to express their true opinions without fear of being judged or put in boxes because people know the poster and believe they know why someone might have said something. I think it gives a truer reflection of the mood of the people. True it allows people to be more rude, but maybe that’s the price of full freedom of speech ? Whatever, if something is said that constitutes a crime, as I understand it at present, “the authorities” can request info about the poster along with IP addresses , so that’s a good use of cyber security and access too. On balance I’m very happy that my data , and therefore that of criminals and terrorists can be accessed and should be able to be accessed by government agencies in the interests of national security . An additional factor to be considered is that once the backdoor (back door?) is opened for the benefit of the security services then the hackers will surely soon follow. This would then potentially leave the general public hugely exposed in terms of individual identity theft which is clearly a much more serious issue rather than individuals merely worrying about a few dodgy twitter posts or websites they may have inadvertently visited. Authorities can be good, can be bad. Can metamorphose too. I sort of assume anything in any form of database can be accessed now. Encryption just a delay mechanism. The ethics question is the same as in a pre Internet age eg before, who should have access to personal written records such as medical notes. I’d never thought that if the security services could access my phone via its backdoor that a ‘bad guy’ could do so too. Overall, I found this to be a good article with good points for both sides of the argument. From a ethical viewpoint, the argument for made use of three theories, but the argument against made less use (unless I missed it). Something to develop in Assignment Two. – if the information were in hard copy form and the law can compel its production, why should information in digital form be treated differently? – does it make a difference if the information is needed to prevent a crime or harm rather than to prosecute an offence ex post facto? – should a contractual relationship be capable of overriding the public good? – could or should companies be required to amend their contacts to enable access to law enforcement agencies for good/ethical purposes? How would you start to define what those purposes might be? – is any system totally secure in any event? Are we being naive in thinking that government agencies don’t, can’t or won’t find a way in? This article will I am sure be as relevant in ten years time as it is today, the questions still being debated for and against. My opinion at the time this situation occurred was that Apple was taking its responsibilities to its users too far. In the end the FBI were able to break the security, however what if they had found information relating to a subsequent act of terrorism that had already happened, that could have been prevented if Apple had cooperated and information obtained in time? Our personal preferences to data security do need to be balanced, however we must not lose sight of the greater good. Security is only bullet proof until it inevitably gets compromised and if the FBI were able to get into the device without Apple’s cooperation, this shows how flawed their thinking around this really was. How many times since this has the IOS of these devices been updated to overcome the latest data security threat? Before reading this article I had only one point of view – for the greater good, however reading this has given me a more balance view and I appreciate that any regulation to allow for a back door will inevitably cause as many problems as it may solve. A well written article on a very contentious subject. Very thought-provoking. We are all ‘open’ to having our internet interactions and personal details obtained by other parties, good and bad. In using the internet we need to accept that this is the case and be guarded about what we choose to share. Opening a ‘back door’ into what was deemed a secure database simply sets a challenge to hackers who will succeed in breaking it eventually. I find government attitudes increasingly ‘Orwellian’ in their instistance on having access to personal data and, as such, applaud Apple’s stance on the subject. Our privacy doesn’t count for much these days with Echo devices having an open-mic in our homes and the likes of Facebook using (and losing) our personal data. Even encrypted apps such as WhatsApp are owned by such companies. Do we really believe that they have the integrity to honour our privacy?